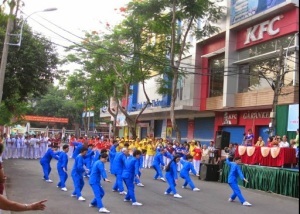 With the motto “live healthy, live happy, live long” spiritual care for the elderly … At 6 am Saturday 25 May 04 2015 at Park Consul Binh Thang, District 11 – Ho Chi Minh City, took place “Vovinam contest nourishing” for nursing students class movement across the county. “Participating in the competition has 16 wards with over 400 middle-aged people. Ward least 16 people, most wards almost 30 people involved, “according to remarks of Mr. Nguyen Thanh Nhan – Director of the Sports Center District 11. Towards Opening and heated atmosphere, seniors collective Vovinam Sen Nursing students and the coach and students of Tu Chanh Vo Sy .Nguyen has demonstrated the exercises: Qigong rights need 1-2- 3, legal woodblocks, Vietnam bird and Yin-Yang sword blade Phalaenopsis France. Regarding attendance and examination there is the presence of Vo Dinh Phuoc Graduate .Le dot (Ward 1, Ward 2), Vo Van Hoang sy.Nguyen (Ward 3, Ward 4), Training vien.Nguyen Hoai Van ( Ward 5, Ward 6), Vo Van Hung Graduate .Le (Ward 7, Ward 8), Vo Sy .Nguyen Van Hiep (Ward 9, Ward 10), Chinese coach Liang vien.Thang – Yellow Belt District Ayurvedic 6 ( Ward 11, Ward 12), Vo Hoai Phuong Sy.Luu (Ward 13, Ward 14), Vo Ngoc Hung Sy.Ly (Ward 15, Ward 16). Jury Vovinam will put on technical points, but the style, costumes, the number of contestants will be the Sports Center and Union County 11 elderly people in charge. Units with 16 or more candidates are not penalized, support enforcement unit shall, not scoring. Mr. Nguyen Thanh Nhan said: “The spirit of the team competition takes quite impressive ‘talent level, energy level’, rhythmic, uneven and beautiful … So the results are not to be disclosed under the original plan but was Flexible change accordingly. Hopefully spirit Ayurvedic practice Vovinam will be scaling over “. – Ward 8 and ward 16 (49 points): At the First Class. – Ward 5 and Phuong7 (48.5 points): At the Runners. – Ward 9 and Ward 15 (47.5 points): Also, encourage class. – Ward 5: Winner of beautiful costumes, expressive with red T-shirt printed with the National flag and Vietnam map behind him, with the words “Sea island homeland”.